Women of Substance | To Be, To Be. Tutubi. 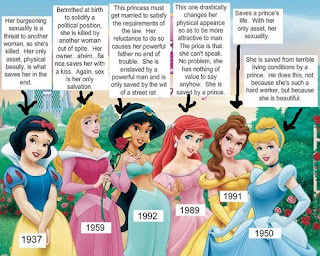 My daughter is not a fan of Disney princesses and quiet truthfully, I am relieved. I really don't think they are good role models for little girls. The picture above, while quite funny is actually true. They do not have much redeeming qualities, other than their kindness and their beauty. While there is nothing wrong with that, I would prefer it if my daughter would grow up to be a woman of substance and not just of form. I want her to grow up knowing her worth as a person, and not just dependent on any man for her happiness. But there is one Disney female character that I would like her to admire and that is Mulan. She is a woman of strength, unafraid to go against everybody's worth just to save her family and uphold its name. Note: Above picture is not mine, its from a forwarded email. Online Shopping Shortcuts: For Real! The Piso Fare is Back!